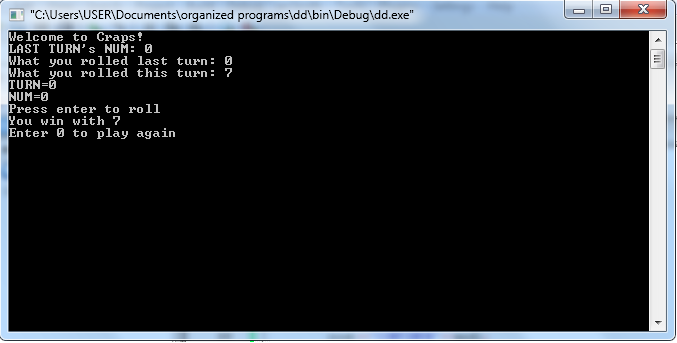 Hi guys, I have an assignment to create a program that simulates the game "Craps" using enumeration. Rules of Craps-Roll two dice. - They roll their initial sum, which means they win. -They roll a 7, which means they lose. Basically my problem is that after a player wins and wants to play again by entering 0, my program outputs a message as if the computer had run a simulation on its own. Its kind of hard to explain so I will do it with screen shots. As you can see, even though my code requires you to hit enter before the next function is called, somehow output gets called without the enter. Edited by Roger, 07 January 2013 - 09:31 AM. The reason of that behavior is that the enter key (newline) you are pressing when the program is asking you with prompt 'Enter 0 to play again' and that newline is causing the cin.get() in method assign not to wait for another enter key press. So the solution is you need to discard one character from the cin stream after pressing a key following the 'Enter 0 to play again' prompt. So just add the cin.ignore() statement after the cin>>ans in the main function. Note, as discarding (or reading the next character) after the prompt will solve this, you can use cin.get instead of cin.ingore to read that troubling 'newline'.